This recipe is the BOMB. It tastes as good as the photos look, and I know ya'll are freaking out over the photos. 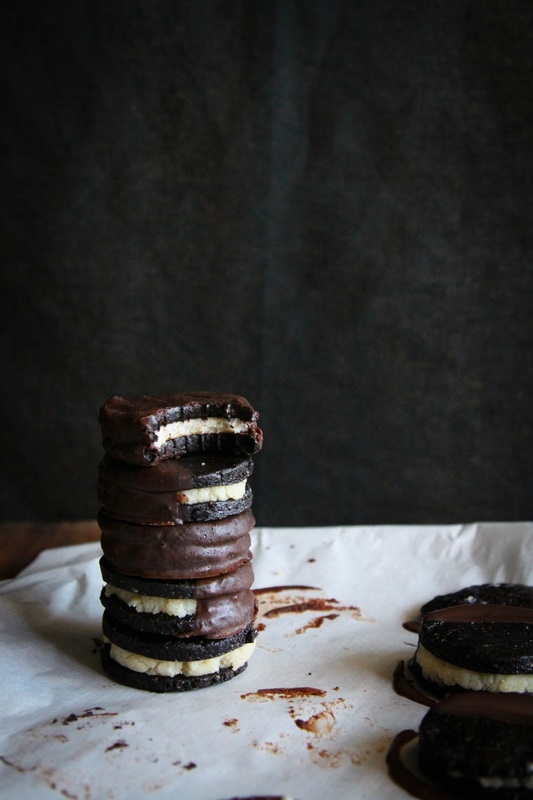 Basically we've got chewy chocolate cookies sandwiching a peppermint vanilla coconut creme filling. Yupp. 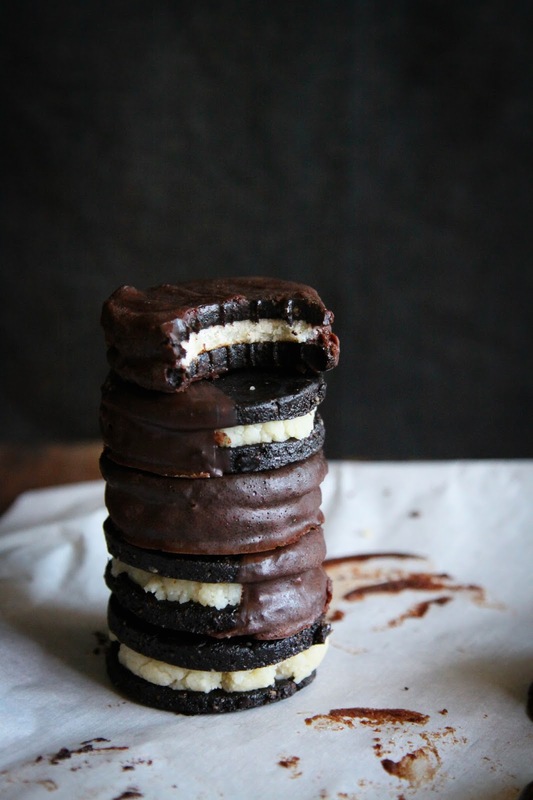 Oh right, then all the cookies are dipped in chocolate, making them double chocolate. Can life get any better? Well, yeah, because these are also really good for you and easy to make. Okay, now life can't get any better. Unless you throw in a bowl of banana ice cream (but that is a constant truth). As usual I give you a bunch of adaption/substitution options so no matter what sensitives you have, you can probably make these. I don't think I need to say much else about this recipe. I mean, look at it. Does anyone REALLY need more information? Get uncookin'. To make the cookies: grind the nuts into flour in a high speed blender or food processor. Add the rest of the ingredients (except the water) to the nut flour in a food processor and process until it all sticks together in a ball. If it's still too crumbly after a few minutes, add a little water. I did this and suddenly my very dry mixture became the perfect cookie dough consistency! Roll this dough out between two pieces of parchment paper then cut out cookies with a cookie cutter. Put them in the freezer until they are solid and can be handled without falling apart. If you have any extra dough, make a giant 'ugly' cookie and sprinkle it with some sea salt. No dough left behind. To make the vanilla creme: blend all the ingredients together in a high speed blender, adding the peppermint oil to taste (it's very potent!) If your blender isn't powerful enough to blend everything into a thick, coconut butter-like mixture, then add some more coconut oil, and perhaps a liquid sweetener or some dates and water. Sandwich the coconut creme with cookies, making little dollops on each cookie then gently pressing down another cookie on top. Throw in the freezer for another 30 minutes or until they are solid and very cold. Make the chocolate, then pour it into a tall, narrow bowl and dip in your frozen cookies. You will have to have 2-3 rounds of dipping, letting the chocolate on the cookies harden after each time. Enjoy! 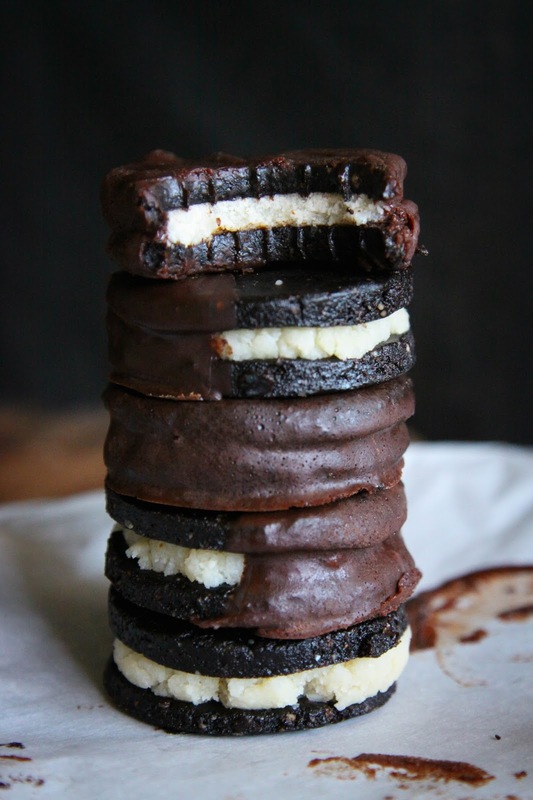 NOTES: if you want the cookies to be darker, add more carob powder; if you want the creme to be whiter, try omitting the nut butter and adding more coconut oil or maple syrup. SUBSTITUTIONS: use oat flour, buckwheat flour, or any nuts instead of almonds or brazil nuts; use cacao or cocoa powder instead of carob; use vanilla extract instead of powder; salt is always optional; use more coconut shreds instead of coconut chips; use any nut butter instead of almond; use date paste instead of coconut oil; use peppermint leaves instead of essential oil.